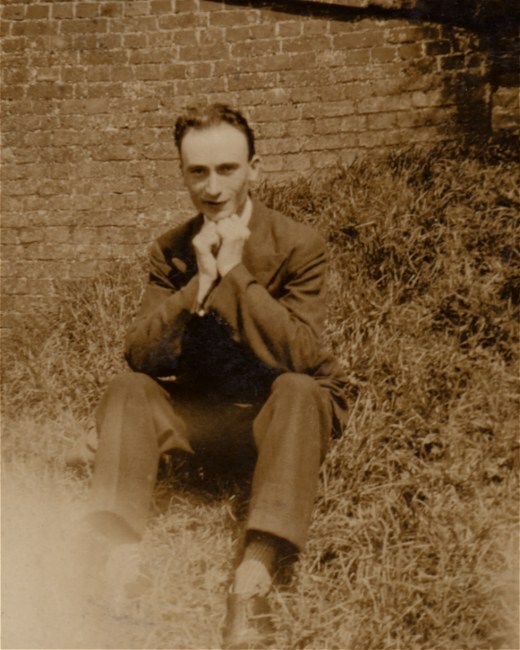 A photo of Fred Atcherley [ ] as a young man. The date of the picture is unknown. As for the place, I suspect it is beside a bridge over the canal near Shebdon (possibly the one shown on this map) in the parish of High Offley, Staffordshire, not far from Flashbrook where Fred was born in 1908. Fred married Louisa [ ], daughter of Thomas Hall. This photograph of a young Louisa was taken at Clarence Studios, 14 Gaolgate Street in Stafford. 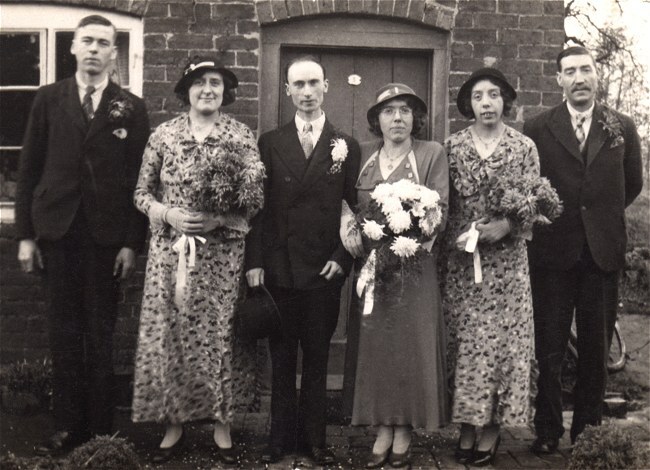 The marriage of Fred Atcherley and Louisa Hall took place at St Mary’s, Longford (map) in Shropshire on 5 Jan 1935. 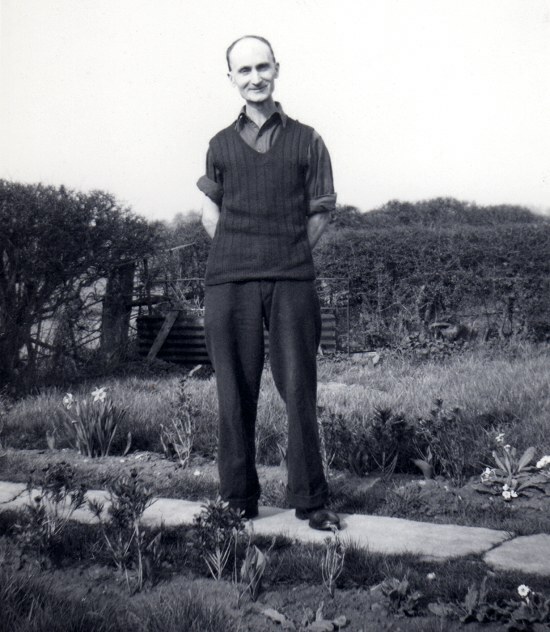 Fred was a baker, aged 26, living at Shebdon, while Louisa was 24 and lived at Longford Mill Cottages. 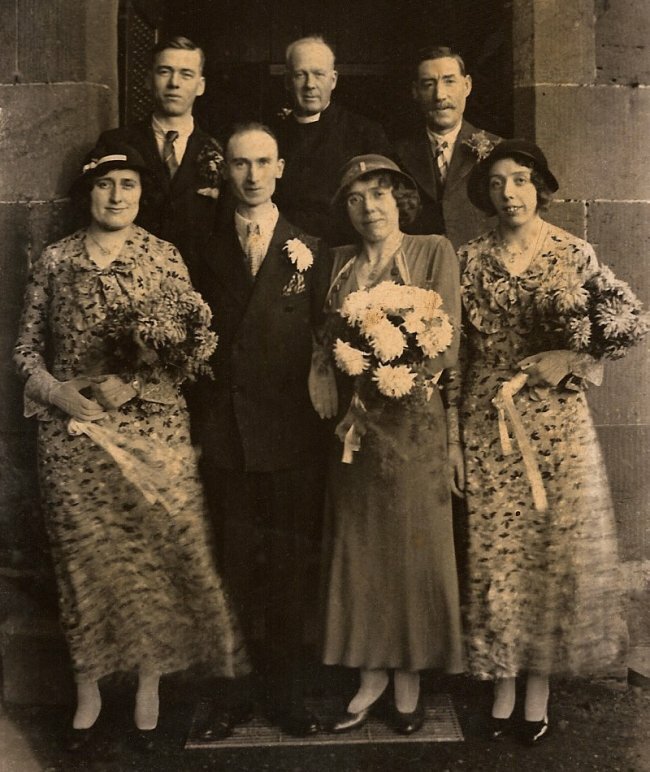 Photographed with the happy couple outside the church on the big day are: front left – the bride’s mother Harriet Annie Hall (née Richards); front right – the bride’s sister Mary Hall; back row, left to right – the best man (identity unknown), the Rector (William M Salt) and the bride’s father, Thomas Hall. Here is the wedding party outside the home of the bride’s family. After their marriage Fred and Louisa Atcherley lived at Batchacre Cottage near Shebdon in the parish of High Offley, Staffordshire. They later moved to nearby Avenue Lodge; the Lodge and the avenue of trees from which it took its name have long since disappeared. 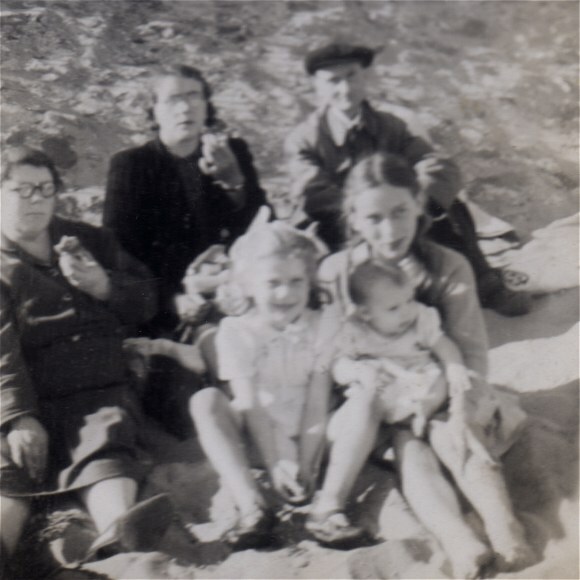 Fred and Louisa had one child, Elizabeth Mary Atcherley [ ], known as Betty, who can be seen in the rather blurry seaside snap above with a baby on her lap. Behind her is Fred wearing his cap (more about the effects of his cap-wearing shortly!) and next to Fred is Louisa. 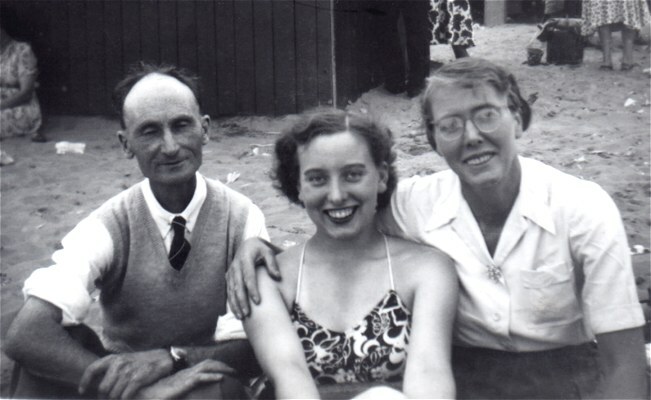 The identities of the other people in the photo remain a mystery – all I know is that the Atcherleys used to go on holidays to Swansea with another family. 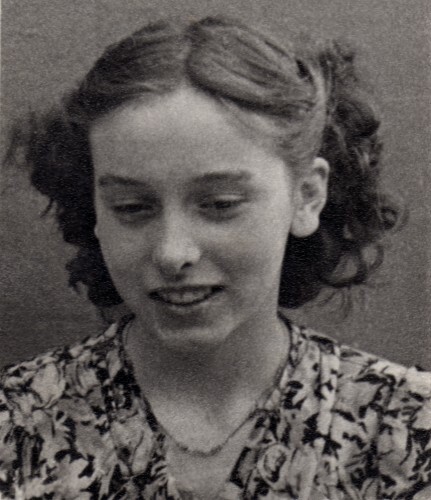 The picture was probably taken around the mid 1940s. 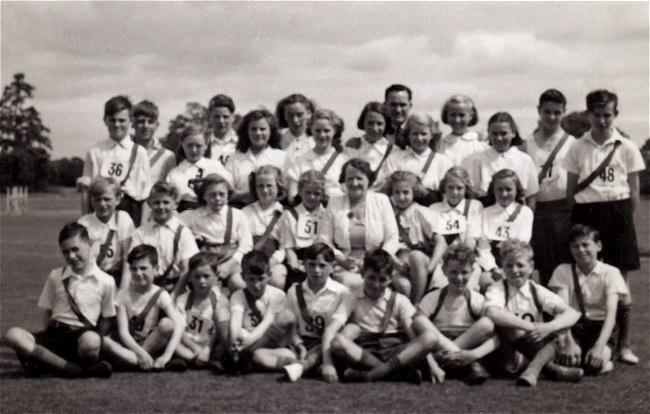 This picture, which is also less than pin-sharp, appears to be a sports day shot of a group of schoolchildren plus their teachers. Possibly pupils and staff of High Offley school at the end of the 1940s, or of a school in Newport, Shropshire around 1950 (which is when the Atcherley family moved to the town, from Avenue Lodge in Staffordshire). A young Betty Atcherley is standing third from the left in the very back row. 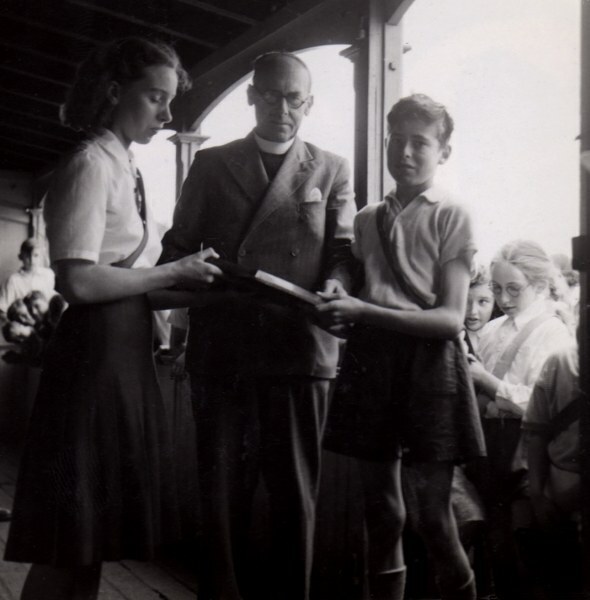 Another photo from Betty’s school days, almost certainly taken on the same day as the previous picture, shows her with a clergyman and an unknown schoolboy, with a crowd of onlooking children, at what may be a prize-giving ceremony. 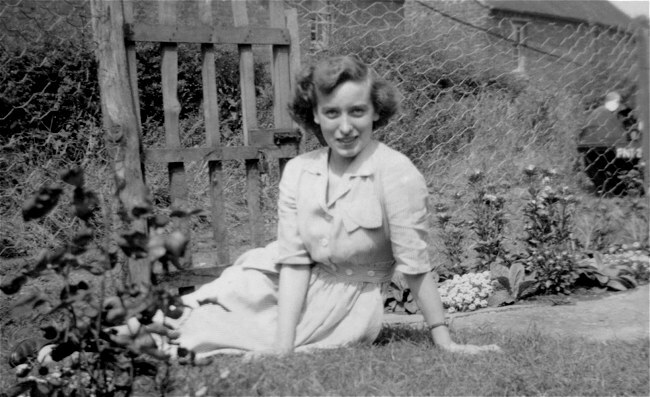 This picture of Betty, taken around the same period as the two above, is a rather grainy but also rather nice portrait of the young Betty Atcherley . Fast-forward into the early 1950s, and we find Fred, Louisa and Betty on holiday in or near Swansea once more (another photo in the set shows Fred and Betty standing beside the city’s coat of arms). Remember Fred’s cap? Years of wearing it while performing outdoor work (he was employed as a farm labourer by Galbraith’s when the family lived at Avenue Lodge) meant that the top of Fred’s head was much paler than his face! 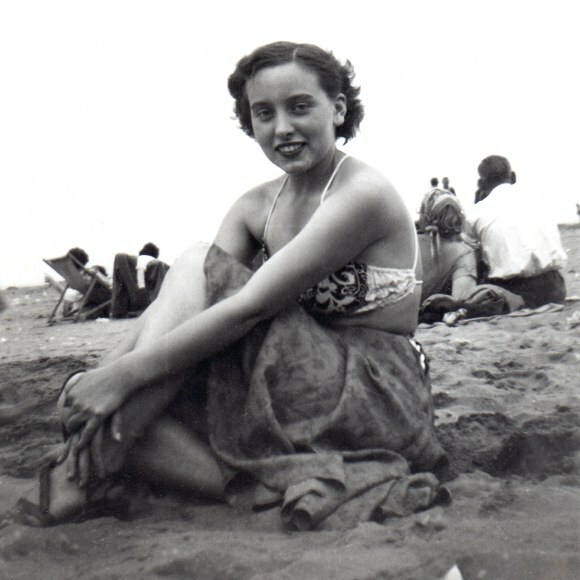 Betty Atcherley, on the same holiday – the belle of the beach. No wonder she caught the eye of a certain young man who was sparring in a boxing booth at the Newport May Fair in 1952. 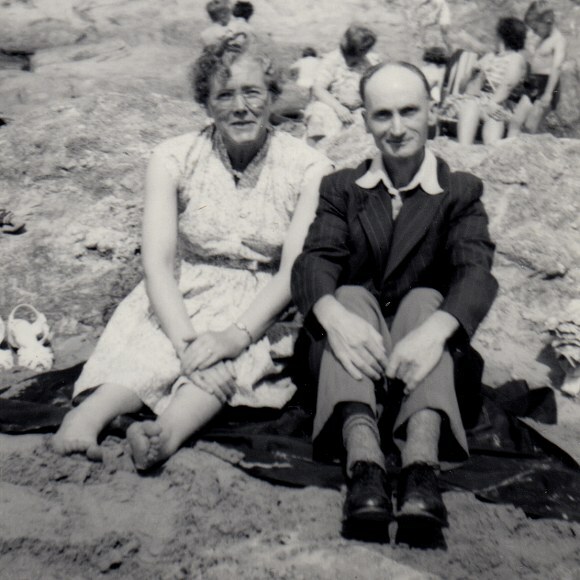 When Betty first met her husband-to-be, at the age of 15, she and her parents had been living in Newport, Shropshire for about two years. 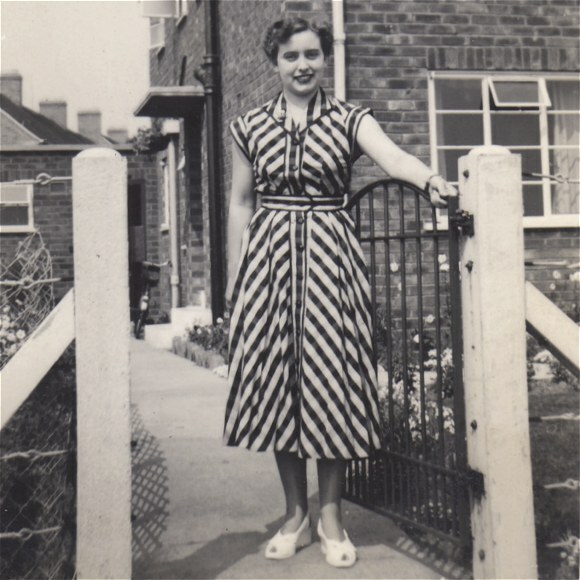 This photo shows Betty in the family’s garden. 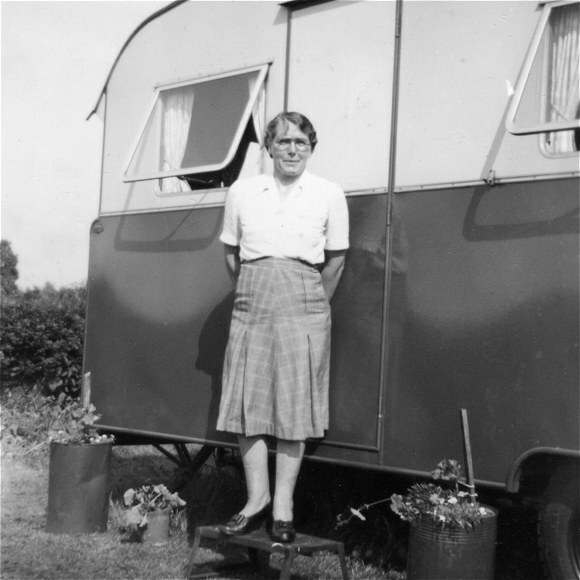 … a Berkley caravan on a plot of land in Vineyard Road acted as home for Fred, Louisa (pictured above) and Betty. Living in Newport did not just make Fred’s journey to work easier and make it possible for Betty to meet her husband. 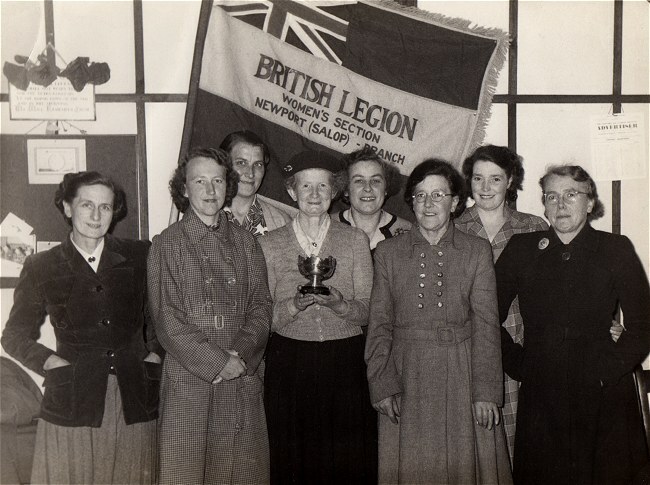 It also widened Louisa’s social circle, and as can be seen from the photo above, she got involved with the local branch of the Women’s Section of the British Legion. 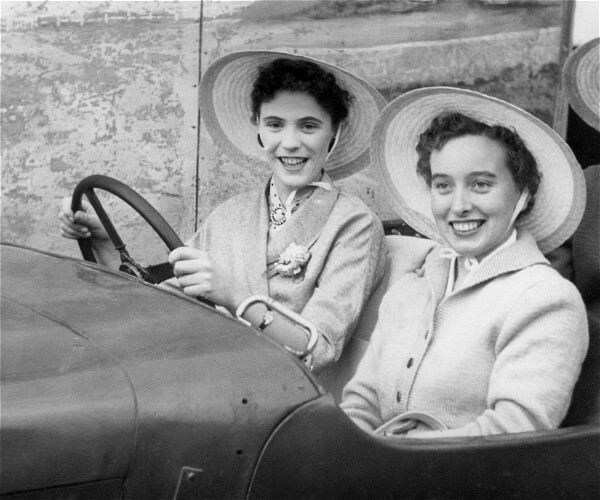 The move to Newport also enabled Betty to spend time with her cousin (the daughter of her aunt Mary) and to make new friends including Gillian, who is shown with Betty in this fantastic photo. 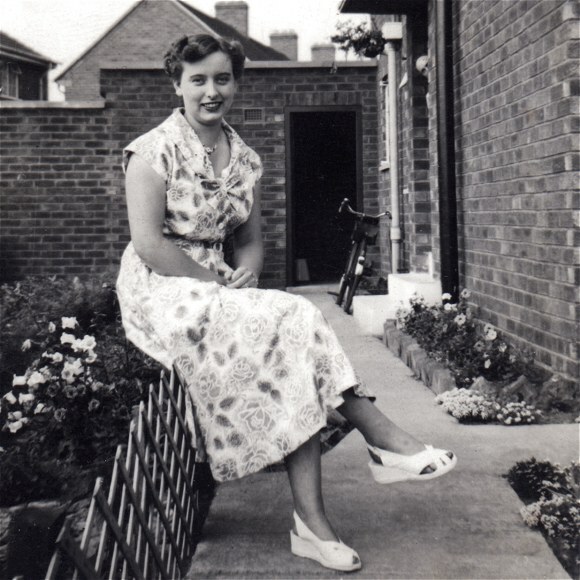 … while this photo shows Betty Atcherley perched on the garden fence nearby. Inside 32 Broadway was where the young man who was smitten by Betty back in 1952, asked her parents for permission to marry her. 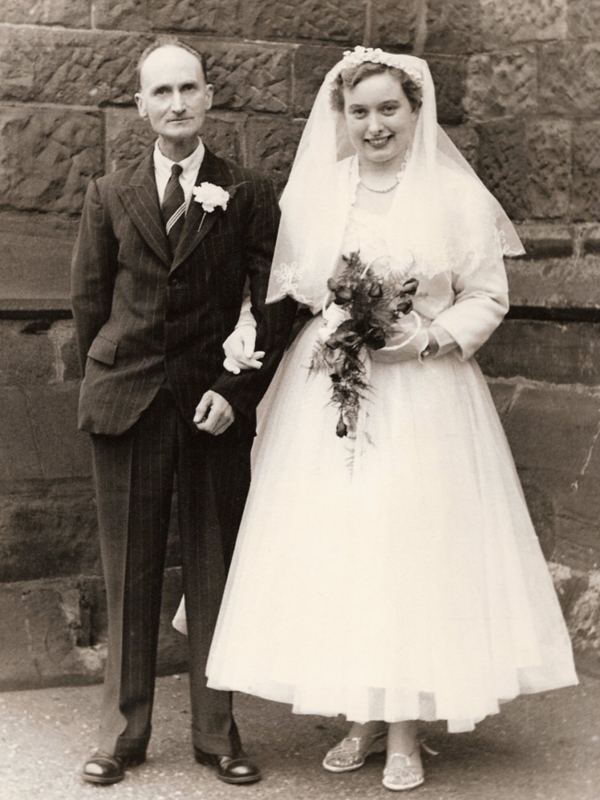 And so it was that proud father Fred Atcherley gave away his daughter Betty in marriage at the church of St Nicholas in Newport in 1956, 21 years after his own wedding. Fred and Louisa’s new son-in-law was a seaman in the Royal Navy. This explains the holiday photos showing them at Plymouth, Devon, rather than at their beloved Swansea! 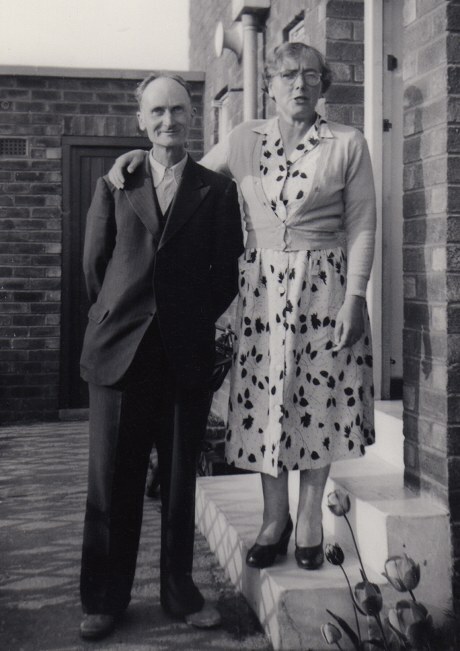 Fred and Louisa Atcherley moved to a house of their own, 72 Audley Road in Newport, around 1960. 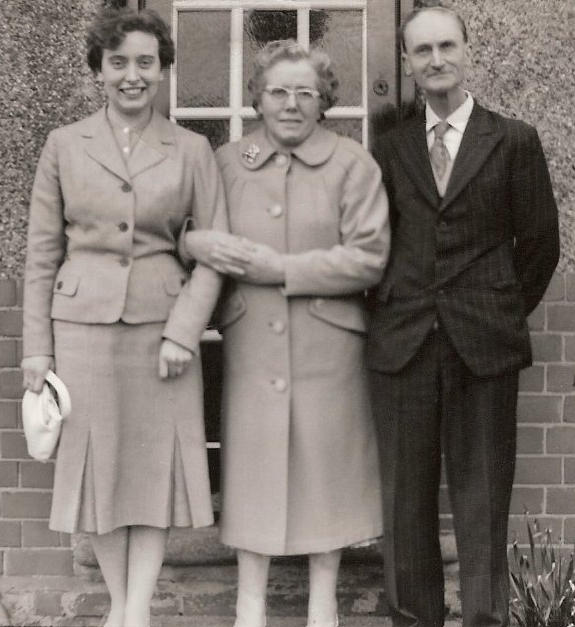 The photo above shows them outside the front door with daughter Betty on the day of Louisa’s 50th birthday, 23 Apr 1961. Sadly, Louisa passed away later that year. Fred lived to see his daughter have three children of her own (including me) before his death in 1970. 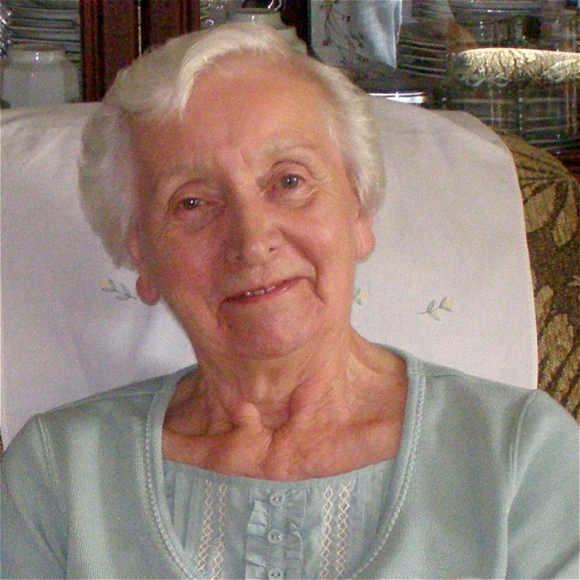 Betty, a much-loved mother, grandmother, great grandmother and wife, passed away peacefully on 22 Feb 2013, surrounded by her family. 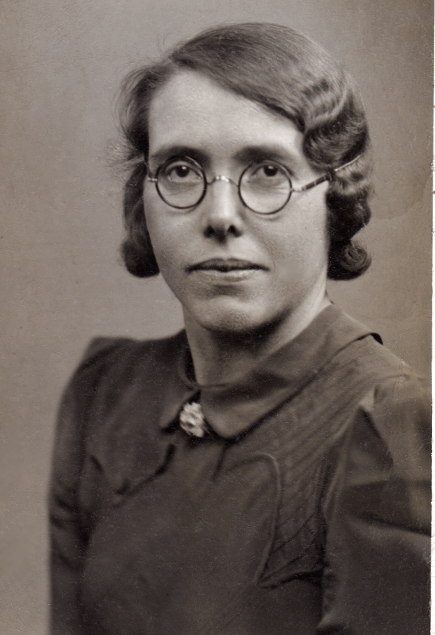 Thank you, Mum, for the pictures above, for inspiring my exploration of our amazing family history, and for so much more.